I’ve been pre-planning my menus since around 2008 and I wouldn’t have it any other way. It just works for my family and especially for me. With all of the other things I have to think about daily, meals are not one of them. Having a pre-planned menu eliminates me having to figure out what we are going to eat on a day-to-day basis. It also eliminates my husband and kids asking me what’s for breakfast, lunch or dinner since our menu is posted in our kitchen. 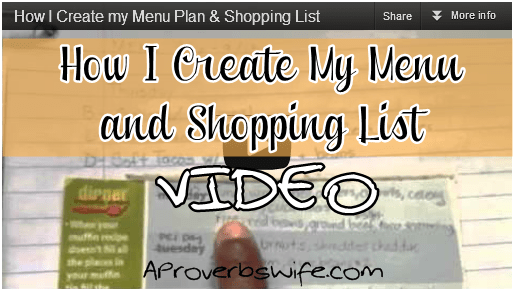 Planning a menu also makes grocery shopping easy and effective. A menu allows me to create a grocery list tailored to what we plan to eat for the week. My shopping list prevents me from randomly buying items and wasting money. I buy exactly what I need which also prevents me from running to the store mid week for something I forgot. Extra trips to the store means wasted gas and time and I can’t afford to waste either. Making my menu and shopping list is very easy. It takes me about 15 minutes to create my menu, cross reference my pantry to see what I have on hand and make my shopping list. Check out the video of my process below. Would you like to know when I’ve created new videos? Subscribe to me on Youtube and by email to be notified.